These policies acknowledge that for intensification to be most effective, it should occur where there is infrastructure to support it, and where it can contribute to the development of transit-supportive centres or corridors, and to the vitality of central areas, such as the downtowns of smaller cities. The centrefold map, Figure 9, shows approximately where and how much intensification occurred throughout the region. In the City of Toronto, we can see that some intensification is clustered in some of the identified centres, such as the downtown core, North York Centre, and Scarborough Town Centre, and along several corridors, such as the Yonge Street corridor and along the lakeshore. But much of it is distributed throughout the City. For a discussion of Figure 9, see page 15. 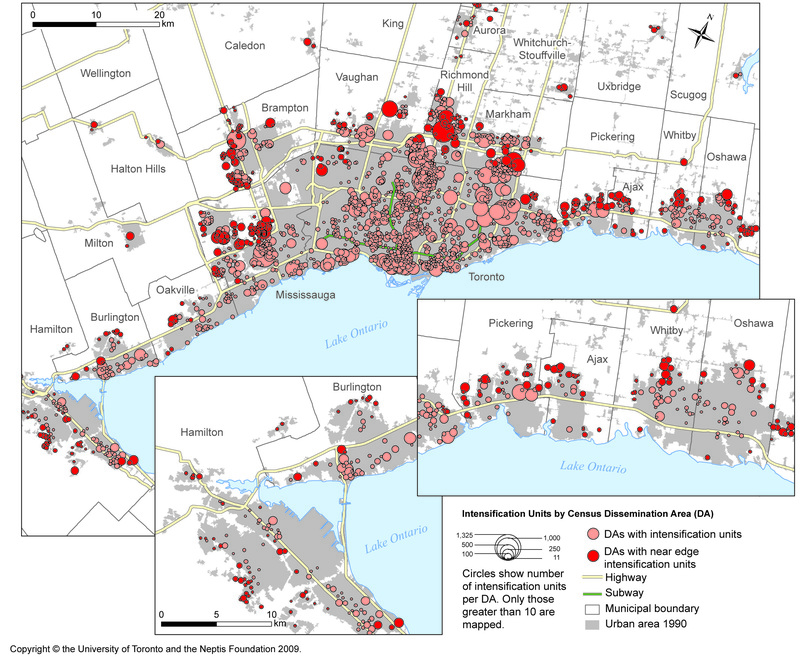 The series of maps shows the relative location and amount of intensification that occurred in the urbanized areas of the Greater Golden Horseshoe between 1991 and 2001.The circles are located in the approximate centre of Dissemination Areas (boundaries not shown on map), small census geographic units. The size of the circle indicates how much intensification is occurring with the smallest circles indicating as few as 11 units and the largest circle as many as 1,325 units. In the suburban municipalities adjacent to Toronto, intensification is clustered to some extent and less evenly distributed, as is the pattern in the City of Toronto. The City of Mississauga is the exception to this rule, where large clusters of intensification occur not far from its designated centre, running along Highway 10 and north and south of Highway 403 where development has filled in the urbanized area. In York Region, a regional municipality that is rapidly urbanizing, much of the intensification is located along the Yonge Street and Highway 7 corridors. In the City of Hamilton, much of the intensification occurred along Highway 8, filling in the established urban footprint. The same pattern can be seen in other older cities, such as Waterloo, Kitchener, and St. Catharines. Yet in many of the outlying municipalities in the Greater Golden Horseshoe, intensification is located at the outer edge of the 1990 urban area. In Brampton, a rapidly growing suburb just north of Mississauga, most intensification occurred at the edge of the urban area. 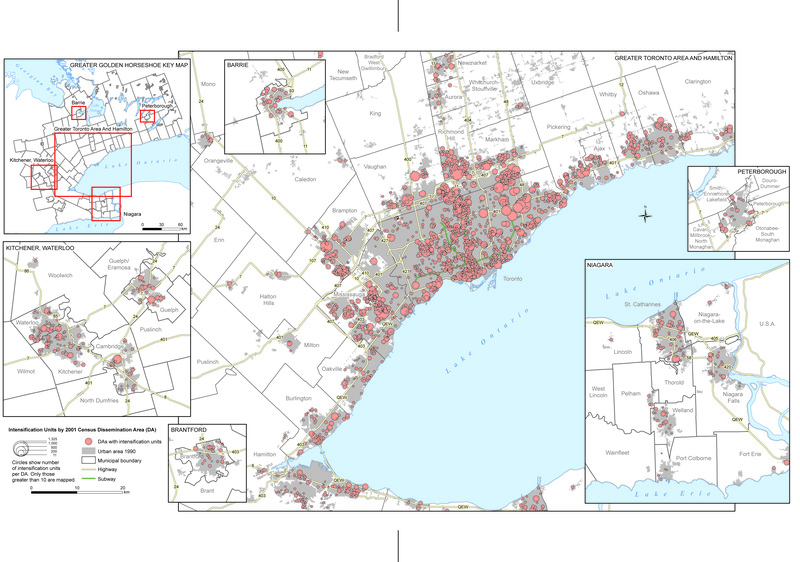 A similar pattern is found in municipalities in Durham Region that are adjacent to the shoreline of Lake Ontario. A minimal amount of intensification occurred in locations other than the outer edge of the 1990 urban area. Peterborough and Barrie follow a similar pattern. This phenomenon required further investigation. We conducted another round of analysis to determine the proximity of residential intensification units to the edge of the built-up urban area. In this step, the number of intensification dwelling units within half a kilometre (500 metres) of the edge was calculated; 500 metres represents a distance of about 5 to 7 city blocks. It is an arbitrary distance, but it was chosen to capture the process of development at or close to the urban edge. In Figure 10, the red circles represent intensification that occurred within 500 metres of the built boundary and the pink circles represent all other intensification. In some cases, nearly half of a municipality's intensification is located near the urban edge (see Appendix C). These findings are relevant for the realization of growth management policies. If most intensification is happening at the edge of the urban area, will it help achieve the goals of the Growth Plan? It may contribute to achieving a contiguous urban area with less spread, but will it provide the critical mass needed to create, for example, transit-oriented communities? Can a municipality achieve the intensification target without achieving the broader goals of the intensification policy? We discussed these findings with provincial staff and municipal planners. Most agreed that the findings were linked to the development cycle, but a question remained: will the near-edge effect dissipate over time? 16. Places to Grow: Growth Plan for the Greater Golden Horseshoe(Government of Ontario, June 2006) s. 6, "intensification areas." 17. Places to Grow: Growth Plan for the Greater Golden Horseshoe(Government of Ontario, June 2006) s. 2.2.3.7. 18. Places to Grow: Growth Plan for the Greater Golden Horseshoe(Government of Ontario, June 2006) ss. 2.2.3.8, 3.2.3(2)(b).